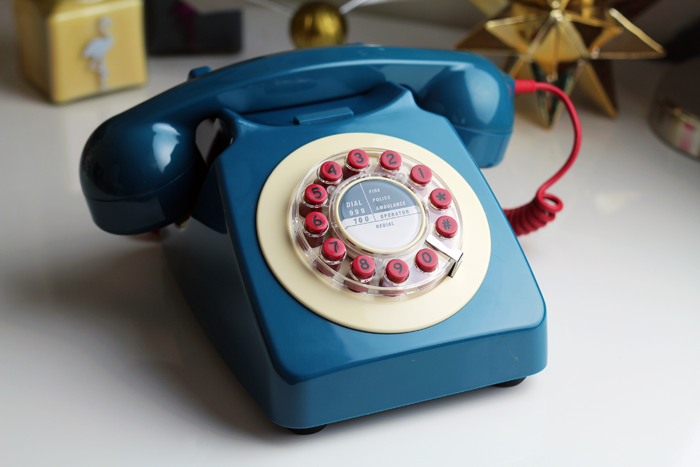 When Flamingo Gifts very kindly allowed me to pick out something from their website to review, top of my list was this beautiful 1960s style telephone. My mum had been hinting that she'd like a phone that didn't have what she calls 'those awful modern ring tones' for a little while and I thought this would be perfect. She was thrilled when I gave her the box, she remembers having something similar when she was a child, and insisted on plugging it in immediately. I must say the sound it makes when it rings is glorious. The slight alteration from the original design, incorporating pushable buttons instead of a rotary dial, is very convenient. I remember my Grandmother having a telephone with a rotary dial when I was younger, it was a total novelty for me but it wasn't always practical, especially if you got a wrong digit and had to start over. It looks brilliant in my mum's kitchen and she doesn't even miss caller ID or an answer machine - I think she's smitten with it! This is so cute! I love the colour. Haha so cute! I love the colours of it too. Ah I'm dying to have one of these for my house! Oh my gosh, this is such a great idea for a product! I don't have a home phone in my house, but would definitely consider something like this if I did! I want a phone like this so much! Miss those days! What a lovely phone! I'd really like a house phone like this, even if it doesn't come with all the mod cons most people want! Definitely going to have to pick one up for my mother, too - she absolutely hates our modern house phone! That is so cute reminds me of those 90s teen movies. I always wanted to use one after watching them. Eee, this is adorable! I was just looking on their website and the mustard phone would be perfect for my parents - it'd go so well with their super seventies living room so I'm glad you posted this as it'll be a great gift :) It'll be a nice replacement for the out of place modern phone they currently have! This is so beautiful! I love little retro touches like this in a mainly modern background - I think it makes your home so much more personal. What an adorable phone and gift! So glad your mum liked it!